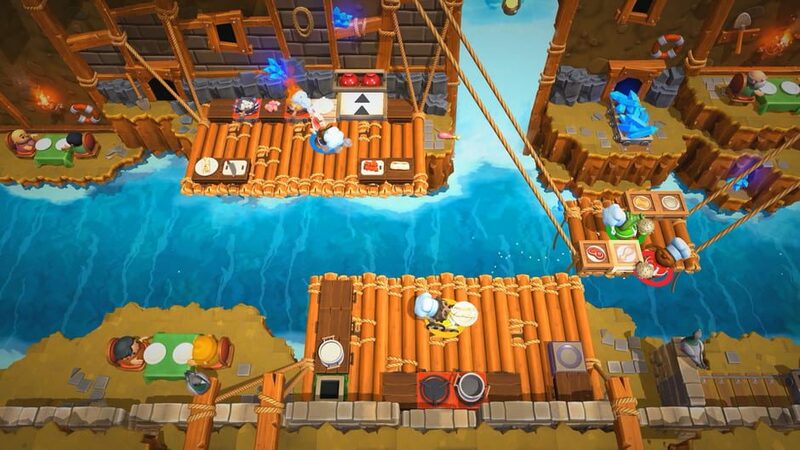 Overcooked 2 is Team17’s sequel to the 2016 game Overcooked. This time around they have expanded on the experience in every way by adding a host of new features like online multiplayer, new stages and a brand new story. The game starts off at a slow pace, but then it speeds up a bit and within no time really starts to challenge you. The variations of the different locations in Overcooked 2 are brilliant, like when you travel in the food truck. You will see that each level is very unique and different from the other. The main objective of the game is to prepare meals for the customers, orders to complete are given at the top left of the screen, you will be on a strict time limit which is displayed at the bottom right of the screen. Getting as many points as you can help towards getting the number of stars you want. At the end of each level, you are given a rank which determines the number of stars you receive. In Overcooked 2 you have to be ready to go, you have to be fast because of the time limit and that’s one of the things I love about this game, it wants to see how much you can actually get done working under pressure. Some levels are harder than others, and you and your team will need perfectly timed co-operation to be successful. For the Switch version I recommend using some kind of voice chat or have a clear plan before you start, so you and your friends know who’s making which dish. The game can get confusing sometimes though, especially if you rush, I learned that the hard way. Some meals are plain and simple to prepare but others require more ingredients and better planning. Cleaning plates is also a big part of getting the food out, you will need to clean the plates so you can put food on them for the next dish. 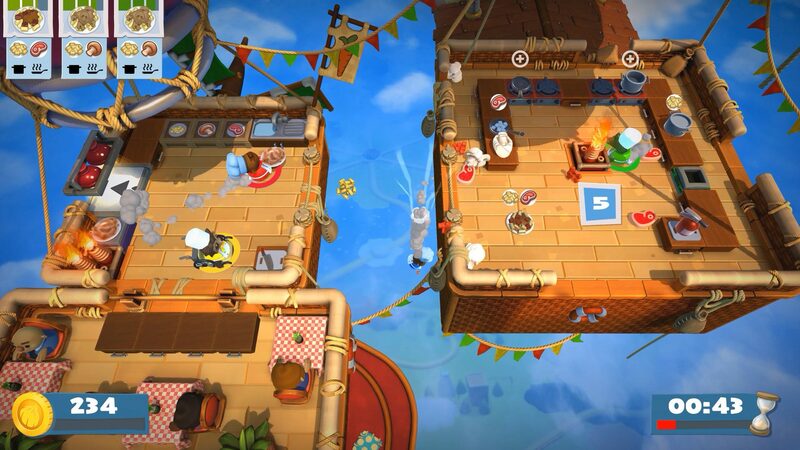 Overcooked 2 is a game to where it makes you feel like an actual chef no matter how old you are. Overcooked 2 does have it’s share of downsides though, ingredients sometimes disappear, it wouldn’t let me pick up a plate at times and I experienced some framerate problems. The game did have a day one patch that fixed most of this stuff so I am glad that my friends and I won’t have to go through that again. You unlock different chef’s as you progress with the story which is a very cool feature that I liked. Another great feature is the ability to jump in and out of a friends story so you can help them and equally they can do the same for you. This game is about teamwork and basically, without that, you will have a hard time but taking it solo really doesn’t take away the experience you get. 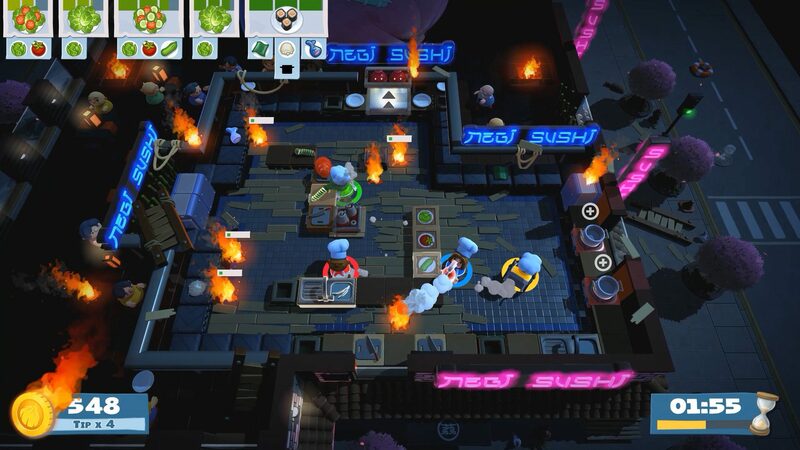 Overcooked 2 is a worthy successor to its previous incarnation and adds features that the first one did not have, most of which made it a lot easier to play and get those all-important stars. It may have its ups and downs but it’s still a very fun game to play with friends, family, or even by yourself.